i Like park min young so I am super excited to see this pairing!!! Looks like fans’ wishes to see more of the elusive Ji Chang Wook on variety shows has finally come true! Ji Chang Wook is set to appear as a guest on the popular SBS variety show “Running Man.” He will be heading to Taiwan for filming from 11 to 12 August, and was already spotted filming this afternoon in and around Incheon with Lee Kwang Soo (a regular cast member on “Running Man”). Expected airdate will be either be 24 or 31 August 2014 — stay tuned for updates! JCW: "Hyung, we're from same university." YJT: "oh really?? Good then." 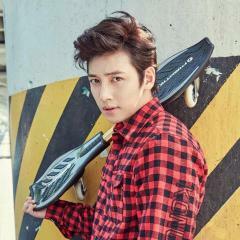 JCW on Running Man wow!! I am anticipating for this drama alright I just hope JCW is with PMY in here. They look so lovely together :x. Interesting whether these two are going to be paired. @banoffee43 thank you for posting beautiful pictures. class="H" style="margin: 0px; padding: 0px; border: none; outline: 0px; font-weight: 400; font-size: 26px; font-family: 'Open Sans', 'Helvetica Neue', Arial, sans-serif; vertical-align: baseline; line-height: 1.4em; color: rgb(30, 30, 31); text-shadow: white 1px 1px 0px; background-image: initial; background-attachment: initial; background-size: initial; background-origin: initial; background-clip: initial; background-position: initial; background-repeat: initial;"
Veteran actors Choi Min Soo and Park Sang Won will be joining Healer! Both actors famously starred in Song Ji Na's "Sandglass" back in 1995, and they also went on to star in her 2007 drama "The Legend". This reunion will be their third one in 7 years. Edit: I realise the article made a mistake! The two also starred together in "Faith". Both actors will play important roles related to the male and female leads. There's no other information available, but I'm guessing they will probably play the fathers and have something to do with the case that the 3 leads are investigating. One of them will be the father of Chae Young Shin (Park Min Young), but the article didn't say if the other actor will be the father of Ji Chang Wook's or Yoo Ji Tae's character. Those of you who have seen Running Man or Warrior Baek Dong Soo will probably be familiar with Choi Min Soo. This will also be the second time Choi Min Soo and Ji Chang Wook are working together, so I'm looking forward to it! Whoaaa this drama is getting more exciting!!! Cant wait for more news on the script,etc..
Woah, we have veteran actors with great acting ability like Choi Min Soo. That man is full of charisma!! This drama is shaping up nicely. Hope it will deliver good drama! Let's create buzz for this drama! "Healer" fighting! It seems like we won't be seeing a Choi Min Soo and Park Sang Won reunion after all. According to various reports, both actors were offered roles to star in Healer, but Choi Min Soo eventually declined to star in Healer because of scheduling conflict with his movie. As for Park Sang Won, he is still considering and hasn't been confirmed to star in Healer. If actor YJT decided to return to drama after a long time, I think the script must be very good to attract him. Following @Kanyaprasetyo's suggestion, I did start to watch the older drama with Yoo Ji-Tae - Star's Lover. (with Choi Ji-Woo) and liking it so far. I have watched several of his films and will continue. Thank you @irilight for the video. Btw those who have watched EK must be familiar with the people in that video, Lee Moon Sik (Bang) and Kim Seo Hyung (ED) =)) =)) We didn't know ED receives such awards. Actress Do Ji Won in talks to join Healer! Do Ji Won acted with Ji Chang Wook 4 years ago in the hugely popular daily drama "Smile Donghae". She has been offered the role of "an important character closely related to the leads" (probably playing his mother again?). She is still considering and her appearance hasn't been confirmed.